I love the cover, Jenn! And for your playlist, have you tried Playlist.com? They don't have a huge selection, but they have a lot to choose from. I love the cover! 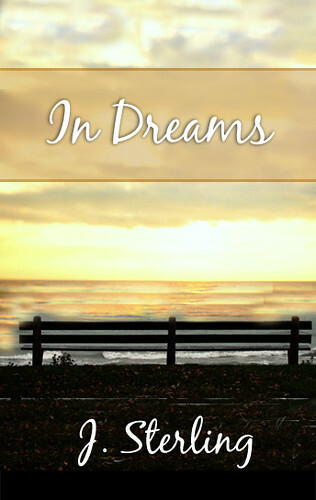 One thing I would change is the white text for "In Dreams" because it's kind of hard to read... that may or may not help but I thought I'd offer my 2 cents. Can't wait to read your book girl! love the opinion! i should see what it would look like in black, or dark orange or something. THANK YOU! love the cover! would definitely catch my eye at the store. But what if you added two people on the bench? Y'know, not what they actually look like, but a dark silhouette because the sun is setting on them? They're backs are to us and they're leaning into each other. Or...you could show a real people type photo of Katherine, leaning on a silhouette guy's shoulder (the dream guy). If that even makes sense: 'real people photo' meaning kind of in color, but still having the sun set on her. luv2 read.. you are SOOOO freaking right on with the couple... i LOVE it! i think i tried to find a couple on a bench before and i never liked the bench.. or the beach.. etc... i love the idea of a girl with her head on a guys shoulder. LOVE! i love books. the covers don't attract me as much as the story line. i am excite to read your book so get on that editor.